Time never stops for anyone, It will disburse everything in its way and move ahead. 2000, December 3 was the day when Malayalam actor and Comedian Bobby Kottarakkara died. Bobby was one among them who came to Malayalam cinema to live their dreams, but at last they left with nothing. He get the role of tea vendor, thief and other side roles in industry, although he left his signature in every character he played. 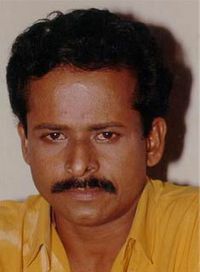 Aziz, later he came to the wisdom of comedy in Malayalam cinema and became Bobby Kottarakkara. He started with "Kathaprasangam" and with his Comic Caper in the play "Ulluk" gets the Super hit tag. After that he turned to drama and later to the silver screen. He get a first break with the movie "Pallattu Kunjikannan"(1980) directed by Boban Kunchako and however his first mainstream movie was A B Raj directed "Aakrosham" in 1982 in which Prem Nazir and Sreevidya done the main roles. After this movie he doesn't get any chance for three years. On 1985, Sibi Malayil directed "Mutharam Kunnu P.O." movie's Remanan character gave Bobby a big break in Malayalam cinema. After this movie he became the part of commercial movies like "Akkare Ninnoru Maran (Gireesh)", "Naradan Keralathil (Appukuttan)", "Vadakku Noki Yanthram (Sahadevan)", "Varavelpu (Pappan)", "Mazhavil Kavadi (Murukan)" are his few characters gets the audience attention. Bobby Kottarakkara never done the roles other than comic infact director not dare to give him preference for important roles. Thaha directed "Thekekara Superfast" was his last movie. It hurts that actor like Bobby Kottarakkara wasn't remembered by Malayalam cinema or any mode of media.